Pipe Marking 101 - Why is pipe marking important? Safety - Eliminate accidents by minimizing identification errors. Efficiency - No wasted time tracing pipes to their source. Compliance - Reduce company liability and eliminate fines. There are four main arenas of pipe marking guidelines. Format - Standards and Formats vary from country to country. Pipe Marking labels must effectively communicate the contents of the pipes, and give additional detail if special hazards (such as extreme temperatures or pressures) exist. 0.75" - 1.24" 0.5" 8"
1.25" - 2.4" 0.75" 8"
2.5" - 7.9" 1.25" 12"
8" - 9.9" 2.5" 24"
Visibility - Pipe markers should be visually accessible upon entering the area. Guideline #1 - Pipes should be marked as close to all valves or flanges as possible. Guideline #2 - Pipes should be marked as close to directional changes as possible. Guideline #3 - Pipes should be marked at points where they have penetrated walls or dividers. Guideline #4 - Pipes should be marked every 25’ to 50’ interval on straight runs. Guideline #5 - Pipe markers should be readily visible when entering the facility from the normal entry point. Creative Safety Supply is committed to being your safety and labeling experts. We provide a wide range of industrial safety products, including made-to-order pipe markers and industrial pipe marking label printers so you can make your pipe markers in-house. Call today! 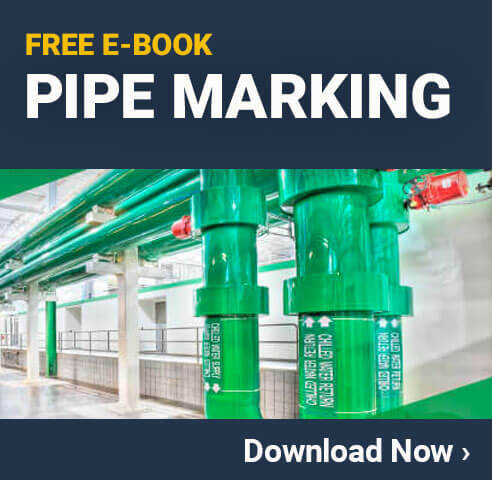 This pipe marking infographic explains the fundamentals of marking pipes in your facility. Marking pipes is important for safety, efficiency, and compliance, and you should follow the ANSI/ASME A13.1 standard for pipe marking. Read to learn the requirements for format, color, height of text, and placement of pipe labels. Standardized labels help people quickly identify the contents of pipes so they don’t have to trace pipes to their source to determine their contents. This is important for maintenance purposes and during emergencies. Want this infographic as a poster?